Summer is a time of heat and warmth,as well as a time of plenty if the warmth is assisted by rain to help the crops flourish. Summer Solstice is the peak, the time when the day and night are equal. From here on the sun is in decline and nights grow longer and darker. In ancient times the path of the sun and the importance for survival was well understood and celebrated. Stonehenge and many other ancient monuments still stand as testimony to ancient wisdom and ritual. The sun features in many ancient religions to provide and sustain life and well being. It became a focus of celebration and its vitality and radiance inspiration for art, music, poetry and dance. 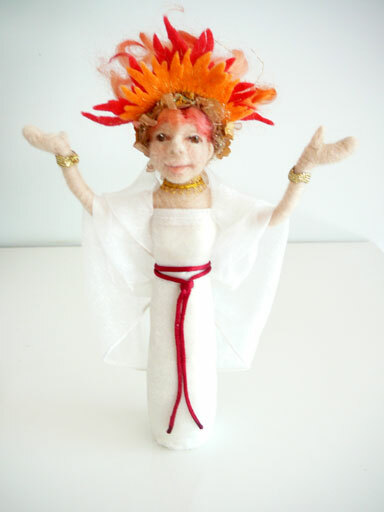 This is a recent commission, a Summer Solstice figure, interesting because there was no pre-formed concept. She emerged with what seemed like a loud a tra ra !. Her she comes out from the muddle on the table, announcing her presence. A Priestess of flame and summer radiance. Her arms outstretched welcoming summer, drawing on the creative energy of the sun. 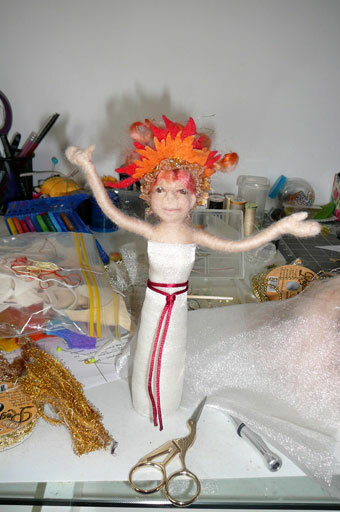 She is needle felted but her costume is formed from crystal organza as I wanted her to shimmer and to radiate and reflect light; that much became a conscious decision after many attempts at trying to find her a suitable outfit. Although we are drawing closer to the Summer Solstice in Australia most will celebrate a Yule or mid Winter Festival . Over time it seems that festivals which were agrarian based to ensure survival have become linked to various religions who have long forgotten the original basis for the celebration. she is beautiful…so welcoming with those outstretched arms !